CES UK has moved quickly to reassure locksmiths who have purchased CES own section self-assembly suites through Citysafe Wholesale Ltd. CES UK's Managing Director - Mario Del-Signore says: "It has come to our attention that as of Thursday 10th January 2013, Citysafe Wholesale Ltd is no longer able to supply CES products. We realise that this will adversely affect a number of locksmiths who have purchased our products in good faith through Citysafe." You've heard such stories. Mat Honan, a reporter for Wired magazine had almost his entire digital life erased when a fraudster used social media account information to trick Apple and Google into allowing him access to Honan's account information. Paul Allen, the billionaire co-founder for Microsoft fell victim to identity theft when an AWOL US Army solider called Citibank and changed the address of Allen's card from Seattle to Pittsburgh, which he then used on a $15,000 shopping spree. The common theme between these two high-profile stories is the way fraudsters were able to penetrate the contact centres of these big companies and misrepresent themselves as legitimate customers. Statistics show that South America is the car theft capital of the world - but does this tell the whole story? SBD's latest research, Global Theft Guide 2012, looks at the worldwide trends in order to profile current market conditions and to predict which markets are most likely to show an increase in vehicle theft in the near future. At the start of a new year, two security specialists have highlighted the main areas of concern for corporate IT security in 2013. The biggest security threats to companies in 2013 will depend on who is attacking the business: Opportunistic criminals will continue scanning for accounts with default or weak passwords, while targeted attackers will refine their attempts to fool employees, business services firm Verizon and security software firm McAfee stated in separate reports. McDonald's is installing a spray in more than 700 stores which covers thieves in DNA linking them to a specific crime for several months, it has emerged. The fast food giant is taking the drastic action following a spate of robberies in its Australian outlets over Christmas and New Year. The burger chain has linked with up with UK security firm SelectaDNA and will now install the system which covers thieves with the invisible, non-toxic spray in all its 780 outlets across the country. Yale has launched a new Premium door handle developed to TS007 2 star standards, completing its "good, better, best" offering to locksmiths within the replacement PVCu furniture market. ailable with The Express Tribune. VDT Direct, a leading developer of rapid deployment video security solutions, has announced that the DV COP Cell portable DVR system has been successfully integrated into WebEye, the recently launched cloud-based alarm monitoring software. This market leading event-driven DVR is used by most of the UK's police forces and delivers evidential quality images for most of UK police forces in wide range of asset protection and flytipping applications. We're almost in February - which means that the Locksmiths' Exhibition will shortly open it's doors. Visitor pre-registrations have made almost 750 so far, so go on, make sure that you don't miss out on the weekend of 2nd & 3rd March. Bargains galore! As well as the chance to buy at the best prices you'll see this year, there are plenty of other incentives to visit the show, including new products, training, and a chance to network with other locksmiths. Plus a free drink if you are visitor registration number 750 or 1000! 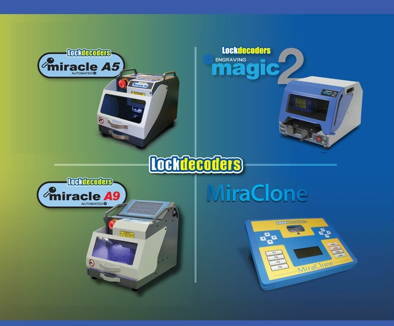 We'll also be announcing the winner of the Lockdecoders' sponsored Golden Key Award to a lucky trainee or apprentice. More below. That's what a number of Roto customers have been asking recently, with regard to their TSL espagnolette. As with any market-leading product, there are inevitable imitations. It happens in every industry. From well-known tablet computers to fizzy cola drinks, there's usually one, original brand and a whole host of similar products that are close, but not quite the real thing. Advanced Keys is pleased to announce that its new interactive product catalogue is now available. You can search within it easily and click through to the relevant page on the website making ordering simple. Just 5 weeks left - We have a few new exhibitors thinking about the last 2 stands and the one re-available after poor old Citysafe stopped trading. If you didn't see that training was available at the show, then now is a good chance to go have a look - one on Impressioning was handed back as the poor guy lost out - Impressioning class or a weekend away with his wife! Oh well. It may still be available when you read this - unfortunately we cannot offer more places as Alan whishes to keep it small enough to help everyone out. The Golden Key Award, sponsored by Lockdecoders, was announced last year in Locks and Security News and sister publication Locks & Security Magazine. Open to anyone under the age of 25 who is currently working as a trainee or apprentice locksmith, it includes both traditional and auto locksmith trainees. The Cabinet Office is to launch a public cyber security awareness programme early this year aimed at improving the online security of consumers and small and medium enterprises (SMEs). The initiative is part of the government's cyber security strategy, aimed at ensuring the UK can manage the risks and harness the benefits of cyberspace, reports Computer Weekly. Statistics have found a surprising fall in crime in the UK over the course of 2012, with 8% less crimes being committed last year; some of the lowest figures in recent memory. Squeezing the electronics into a smoke alarm case offers the perfect solution for 360 degree camera implementations in sensitive environments. AMG-Panogenics, the British manufacturer of sophisticated Megapixel cameras, has developed SmokeCam360 - an ideal solution for 360 degree fisheye camera implementations in sensitive environments such as care homes, hospitals, nurseries and more. 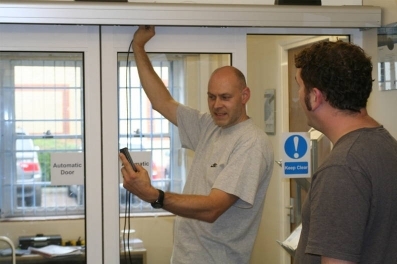 Global Automatics has extended its range of free training courses on automatic doors. Course lengths run from one-day through to eight-day courses for new people, run on a one-day per week basis. Different courses are available and bespoke courses can be put together based on specific needs.